Working with community partners, the 2016 Camp Promise will be held at five locations in Lenoir County from July 5 – July 29. 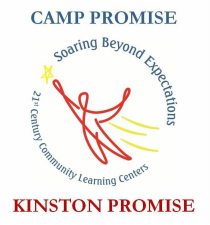 Camp Promise at the Kinston Promise Learning Center located at 131 N. Queen Street will serve female students in grades 3-5. Camp Promise at Living Faith Christian Center located on Hwy 258 South will serve students in grades K-5. Camp Promise at LaGrange-Frink Alumni Cultural Center will serve LaGrange students in grades K-5. Camp Promise at Queen Street United Methodist Church will serve young women in grades 6-8. Camp Promise at St. Peter Church will serve young men in grades 3-8. Additionally, Camp Promise for Girls will be held at Temple of Zion International Ministries in Greenville, NC from July 18 - July 30 for girls in grades 3-8. To register your student for Camp Promise please call 252/208-1690.